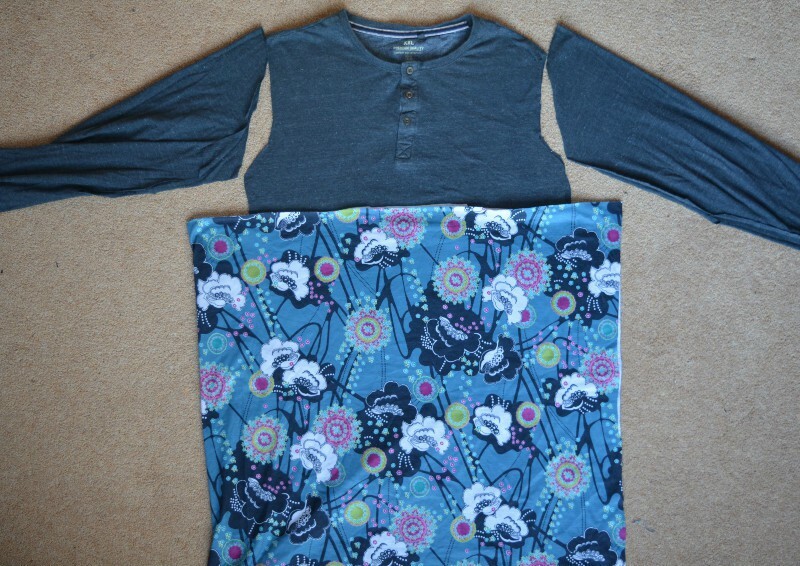 Remember the three tshirts transformed into two baby dresses from last week? Before I chopped up the tshirts I had a thought about creating myself a top too. 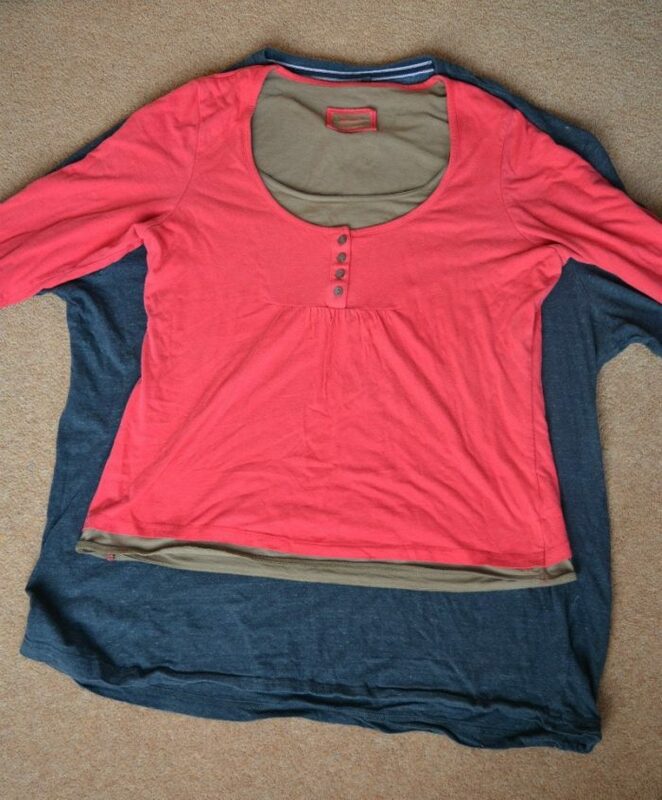 I started by comparing the navy long-sleeved top with a knit top which fits me well. I used this as a rough pattern. 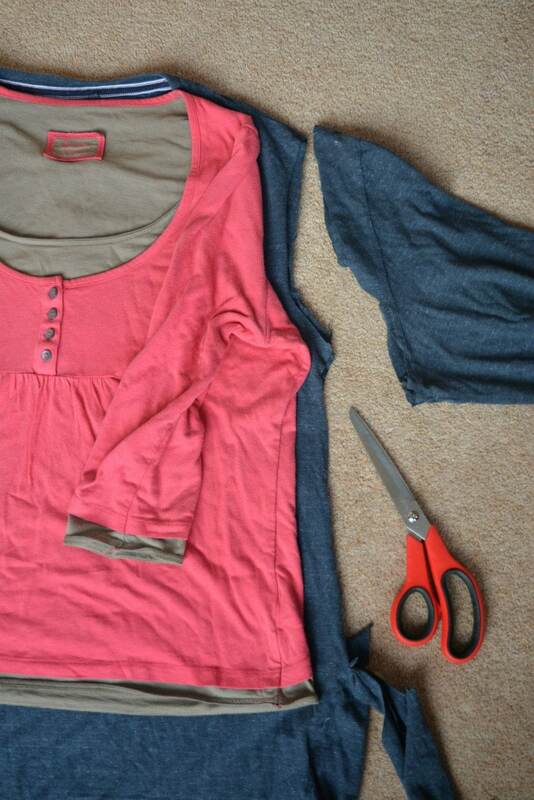 The idea to utilize the upper part of the top plus sleeves, saving the bottom part of the tshirt for the dresses. It was clear I needed to refit the sleeves as the shoulders were just too big. I laid out my pattern pieces, feeling quite excited about how the top was coming together. The knit fabric was kindly given to me – I love the pattern. But as I sewed it up I was a little disappointed with how the top hung. So I moved the seam between the two fabrics higher and shortened the overall length of the top. The end result? 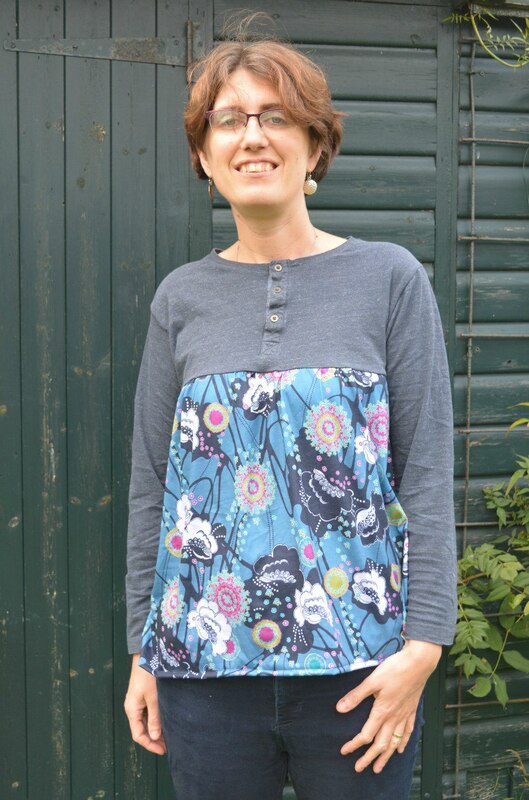 To be honest it feels like a maternity top (and I have no need for one of those!!). 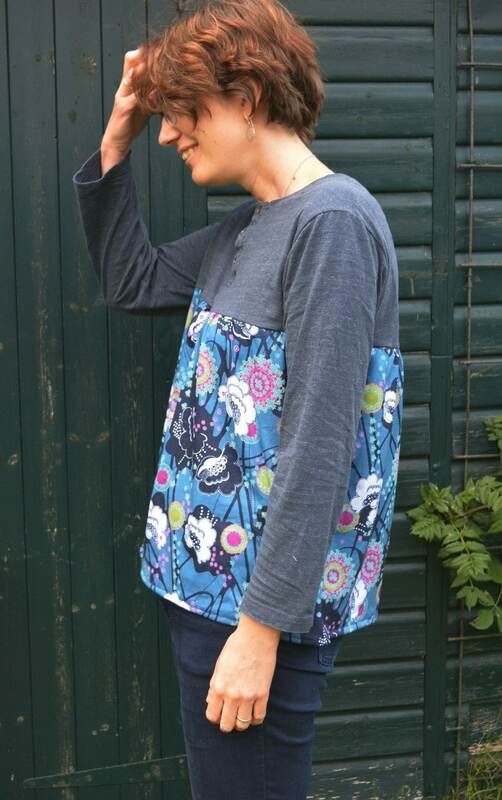 I do love how sewing with upcycled materials means it really doesn’t matter if it goes wrong, you can just have a go! I would never chop into sleeves on a brand new top!! Looks fantastic – well done Vicky; you’re on a roll! I love the way the pattern and top colour look together. I can’t offer any advice because I’m not very good yet with my sewing machine. Thanks Vicky, I suspect if my daughter sees it I will have a few comments that I should have made her a skirt!! You are so clever and brave with your refashioned garments. Would darts in the front from bottom to seam help? I don’t think it looks maternity. But if you think the bottom feels to full, maybe you can take it in on the side a bit to give the waist more shape. Have to admit I am now wondering if it would hang better if I pressed the hem!! I think that is the way to go, plus a good press:)! 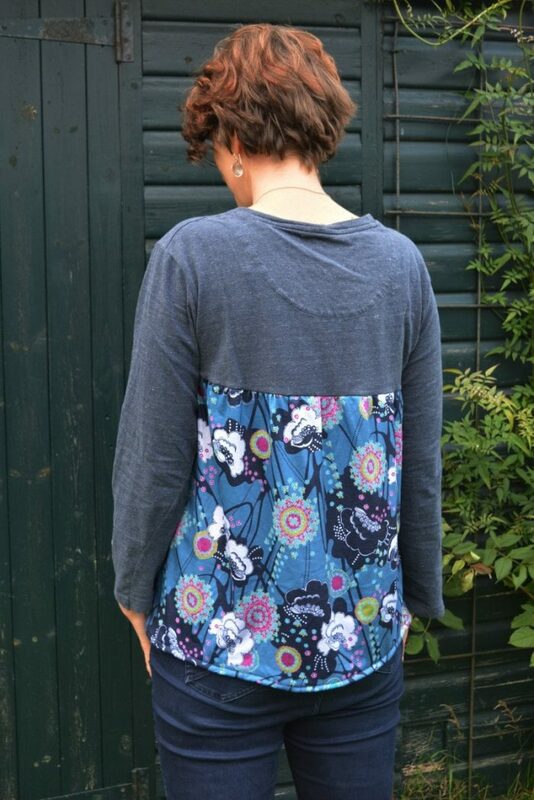 I would make or add ties to the sides and then it would cinch in at the waist if you tied it at the back.